Last May, when Texas A&M played Auburn in the SEC Tournament, the Aggies sent left-hander John Doxakis to the mound. He responded with a marvelous pitching performance, outdueling future No. 1 pick Casey Mize in remarkable fashion. In a primetime nationally televised game against an elite SEC pitcher, Doxakis was up to the challenge. That setting repeats itself again and again over the course of a regular season – it’s called Friday nights in the best conference in baseball. John Doxakis gives the Aggies a key ingredient they were missing for much of last year – an uber-talented starter of their own to match up against the plethora of aces they will see in SEC play. Mitchell Kilkenny pitched valiantly for A&M last year, but the Aggies were a dismal 3-7 in conference series openers. With Doxakis leading the squad into battle each week, that record should be much improved in 2019. There could be some tough-luck losses, to be sure. That’s to be expected when almost every team in the loaded SEC has at least one high draft pick in its rotation. But the bottom line is that Doxakis is an elite front-line starter who could be a first-round pick with a good year. He finished last year on a tear, going 2-1 in his last three starts with a miniscule 0.95 ERA. He struck out 28 and walked only five in 19 innings in those starts, winning two postseason starts in the process. The Aggies are hoping sophomore Asa Lacy is ready for prime time. Behind him, Asa Lacy also has the potential to be dynamite on Saturdays. The 6-foot-4 sophomore from Kerrville flashed greatness against Georgia in the SEC Tournament, blanking the Bulldogs over six innings, striking out eight with only three hits allowed. His fastball consistently sits in the mid-90’s alongside a good breaking ball and changeup, and he dominated good competition this summer in Alaska. He has all the makings of a star, and if he continues to develop, he will be a first- or second-round draft pick as well. Behind those two big lefties is where it gets interesting. Head coach Rob Childress has a lot of pieces to choose from for his Sunday starter. Sophomore Chandler Jozwiak has a solid chance to get the nod. The lefty from Brenham started the season in the weekend rotation last year before moving to the bullpen, and he has been consistent in the fall and spring scrimmages. Freshmen lefties Jonathan Childress and Chris Weber are also in the conversation. Childress was one of the best left-handed pitching recruits in the country out of Forney High School last year, and he boasts a wipeout curveball to go with a low-90s fastball with sink. Chris Weber throws four pitches for strikes and put up sparkling numbers in the fall and spring. Christian Roa made a play for a starting role in Saturday’s Maroon and White game, as he tossed three hitless innings against an Aggie lineup that featured most, if not all, of the opening day starters. Roa would be the lone right-hander of the rotation, but Rob Childress has said he has no problem with a rotation full of lefties. I see Roa as more of a reliever, while Dustin Saenz has also been stellar this preseason and could get the nod. Whichever way Childress decides to go for opening weekend against Fordham, the starting rotation should be much improved over last year. Doxakis is a legit ace on Friday nights, Lacy is a high-ceiling if unproven fireballer who could blossom into an ace as well, and whoever wins the battle for Sundays will be there because they deserve it. As always, the rotation could and probably will change over the course of the season as Childress moves the pieces around to find the optimal group. 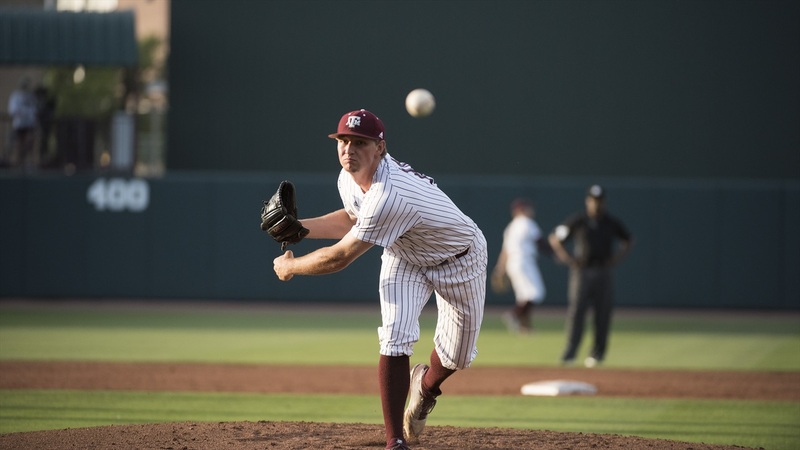 However things fall, the Aggies are more loaded on the mound this year than last, and with Doxakis leading the charge, they’ll head into most Saturdays trying to win a series rather than salvage one. Ready for Texas Aggie baseball! Anxious to see Rob and the boys!